Green Acres Stable has been around for many many years. Dawn Dascomb moved in in 1994 and has made it home to her business and passion. Primarily focused on Eventing and Dressage we cater to all levels of riders. 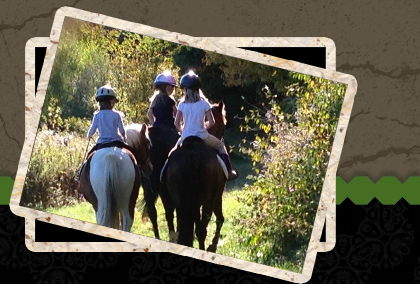 We have a reputation as being a kid-friendly and horse friendly barn. With horses turned out in paddocks and fields all day and knowledgeable, experienced and conscientious staff horses and owners are happy. We are an active barn with active owners. We do everything here... boarding, lessons, training, day camps, event camps, breeding, horse shows, events, trail rides, beach rides, cross country schooling and clinics. Always somebody to ride with and enjoy your passion with. Dawn Dascomb earned her USDF Bronze medal with her homebred Tre and is halfway to her silver medal. In 2012 her two mares were 12th in the country in their respective USEA levels. In 2003 Dawn won USEA Senior Open Novice Championships Nationally. Dawn's horses as well as her students have won many Regional and National awards at the lower levels of eventing. We have participated in 6 National USEA Championships in the last 7 years successfully as well as students participating in the US Pony Club Championships. Dawn believes that training and developing take time and understanding. Training with Janet Briggs, Karl Mikolka, Suzi Gornall, Verne Batchelder, and other great clinicians over the years has helped her develop a program that truly works on the horse and rider understanding the training pyramid and building a strong base. Her education and understanding also come from working with massage therapists, chiropractors, saddle fitters and vets. Understanding the horse and rider as a whole help to develop the horse and rider with an understanding of them physically and mentally.